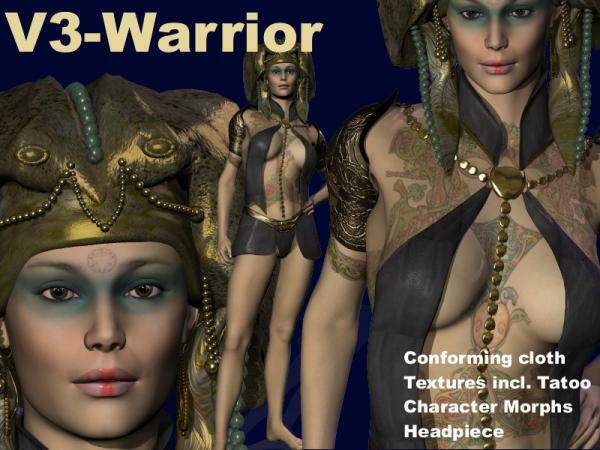 Complete character including conforming cloth and a hires tattooed character texture. Cloth is morphable so it should fit nearly any pose. Some nice custom face- and bodymorphs are also included. The characters texture is hires and detailed. Use it with some skin-shaders und you will get real professional results. Note: Some users report problems while opening the package. Maybe you see an empty ZIP package - but this is only because the first path is not shown - for what ever reason. Click on this "invisible path" (or whatever you may see) and the runtime folder appears. Don't forget to have a look at my portfolio here at shareCG. Maybe you'll find other items usful for your creations! Hmm: I wonder if it will fit Aiko3 & 'Fembot', too ?? stormwolf2 (6 years ago) Inappropriate? Wow! What can I say? The character+outfit are awesome. Thank you so much! Thank you for this awesome Outfit! Magnificent gift! Thank you very much. Thank you - looks beautiful! SouthernBelle (10 years ago) Inappropriate? Would LOVE this for V4!!! It's absolutely gorgeous!!! I just cannot believe how beautiful this package is! Everything is just lovely, the character, the outfit, but the headpiece is what really rocks my world! Thank you - I have never been disappointed when downloading your work. gengeorgeacuster (11 years ago) Inappropriate? Thank you all for your friendly comments. Marco (12 years ago) Inappropriate? @kirili: Sure, if you make it a freebie. Just insert a link to the original item for your visitors. Ahh! I like to see links here! What about posting a link to a picture where I can see my items in action? AUMaize Designs (formerly LA3D) (12 years ago) Inappropriate? Awesome outfit and character pack. Thanks! Are we allowed to do our own textures for this outfit? Yes, V2 was a great figure, too. But V3 has anything to become an everlasting 3D figure. V2 is still often used as background figure or with animations. Thanks for your comment and for downloading!